Over the past 10 years, thousands of survivors, patients and supporters have joined together at Pan Pacific Park in Los Angeles to raise research funds and awareness for ovarian cancer through Run for Her®. These efforts have been nothing short of inspirational and motivating! In fact, the event has been so successful, we’ve outgrown our venue. 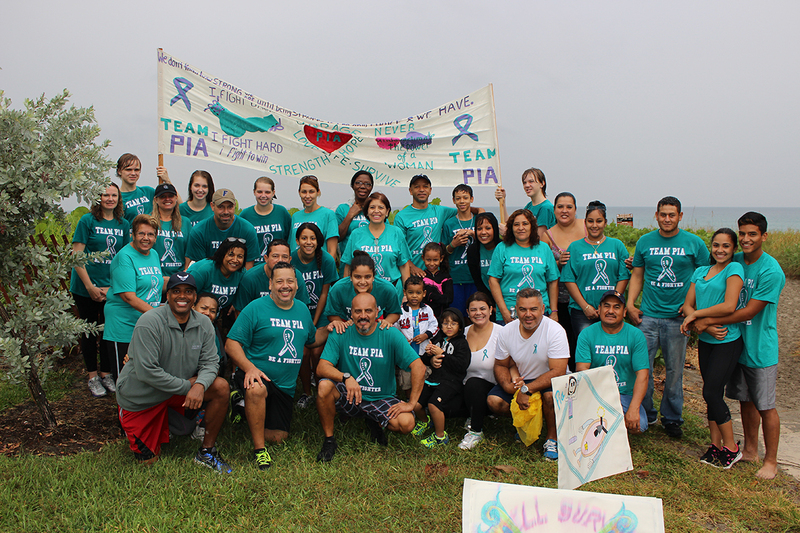 While we consider options for another physical event for 2016, our fight against ovarian cancer continues. In 2015 alone, more than 230,000 women will be diagnosed with ovarian cancer, and more than half of these women will lose their life. We need your continued support to find effective screening methods, treatments and eventually, a cure. We’re pleased to invite you to take part in our virtual event. This virtual platform is all about your voice and your story. We’re looking to you, our loyal supporters, to help raise even more awareness and even more funds in your communities and neighborhoods. By sharing your strength and your reason for participating in Run for Her, you’ll motivate others to join the movement. Share your story here. As a participant of this year’s virtual event, you’ll still register, create teams and fundraise for the cause. You also will receive a Run for Her t-shirt and bib! And most important, you’ll still have opportunities to generate support and build relationships. Then on event day, Nov. 15, 2015, we will go vocal, local and social. What does this mean? Go vocal: As a participant, you will have the opportunity to share your personal connection to Run for Her. Why do you participate? Featured stories are highlighted on the Run for Her home page. Go local: Don your T-shirt, gather your friends and head out into your community. Set a personal goal with meaning. For example, if you are walking for your sister who is 42 years old, you might set your goal as 4.2 miles, or 42 minutes. Go social: Post images of you in your shirt to Twitter, Facebook and Instagram using #RunforHer. Include a brief fact that will help raise awareness about your story and the cause. People around the country will be doing the same thing, so throughout the day; you can check your social media feeds for inspiration. We look forward to your continued partnership and energy as we make a meaningful impact in our own communities. Our latest guest blog comes from 11 year-old Victoria, a Florida resident whose cousin is fighting ovarian cancer. Here’s her touching story in her own words. My name is Victoria Segarra, I’m 11 years old and I live in Boynton Beach, FL. I registered as a sleepwalker in support of my cousin Pia (Maria). 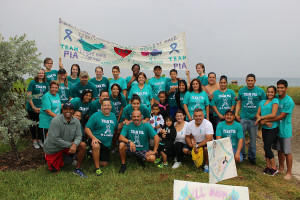 Pia has been fighting with ovarian cancer for more than two years. On Sunday, Nov. 9, we invited friends and family to join us – and not even the rain stopped us. Pia is a very pretty woman and very smart, she teaches 8th grade science in Riverside, CA. She’s 29 years-old and a very creative and fun person to be with. Pia is my hero and my best friend. “with all my Love to you Pia” from Chiqui. (We couldn’t take one picture of everybody because all the kids went to play soccer). Diane Darling, a long-time Run for Her participant and co-captain of team Dorene’s Darlings, moved from California to Colorado earlier this year. Despite the distance from California and the annual Run for Her event in Los Angeles, Diane was determined to participate in the event and make it a success. Here is Diane’s story in her own words. The first ever Run for Her Sleepwalker event was a success in Carbondale, Colorado! 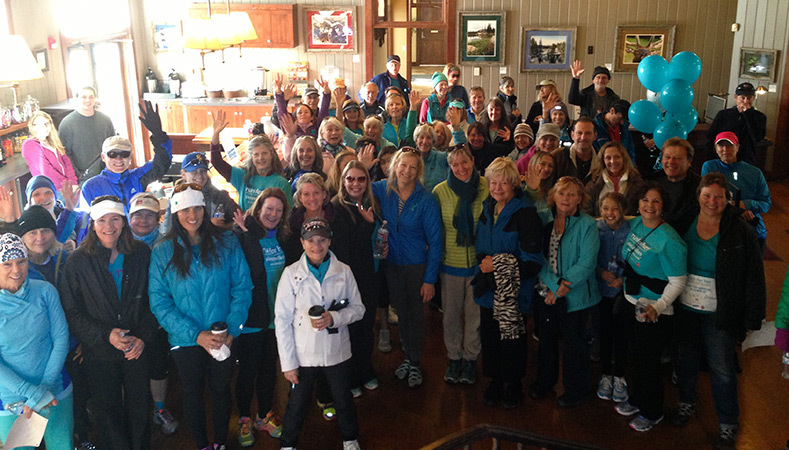 Almost 70 people came out Sunday, November 9, 2014, early in the morning to learn about the symptoms of ovarian cancer and to participate in a 3.7-mile walk around the River Valley Ranch Loop. I was thrilled with the community turnout, which included friends, local residents, and survivors of ovarian (and other) cancers as well as people just completing treatment. I was deeply touched to meet these people who have fought the battle and come out the other side. I congratulate them and admire them for participating in events like these. Even though I didn’t formally fundraise this year (the focus being more on awareness and prevention), our team, Dorene’s Darlings, raised over $1,400.00. I can’t wait till next year! 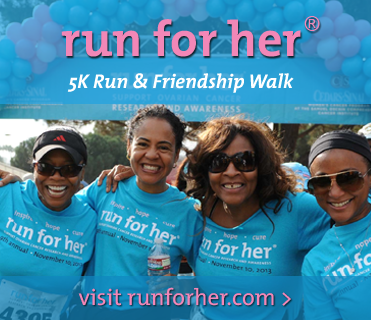 Support from Run for Her forms the foundation of our work at the Cedars-Sinai Women’s Cancer Program. 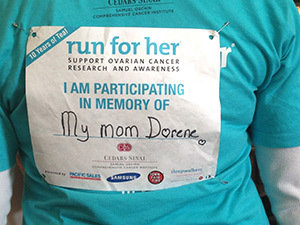 First, Run for Her increases awareness of ovarian cancer in the U.S. and around the world, teaching women (and men) to be alert for symptoms and to see a qualified healthcare provider if they suspect the presence of disease. Second, the funds raised by Run for Her make it possible for us to find new ways to diagnose and treat this terrible disease. Run for Her is helping us change the course of cancer and save lives. To find out more about how your support is helping Dr. Karlan and her team in the fight against ovarian cancer watch the video below. In early October we shared a new video series with you featuring Beth Y. Karlan MD. These videos are intended to address your most asked questions about the importance of run for her, as well as the ground breaking research efforts of Dr. Karlan’s team of physicians and scientists. Dr. Karlan first explained why research has been slower for ovarian cancer than for other cancers. Next Dr. Karlan talks about hereditary predisposition to cancer and genetic risk factors.